Board games Production. part 2 : Wooden parts. Wood is ubiquitous in modern board games. Wooden meeples and cubes are a staple of euro games, and many of the games that use cardboard tokens and plastic pieces also have some wooden gaming pieces in the box. As a board games publisher, you will normally not deal directly with the wood suppliers themselves. You have your manufacturer source the parts and deal with that aspect of things for you. The manufacturer usually are specialized in cardboard processing and parts assembly, and they have a wide network of suppliers for all the various things boardgames publishers ask them to put in their boxes. Need a sand timer ? Spinner ? Wooden cubes ? Whoopie cushion ? Plastic or metal whistle ? They probably have a solution for you. In fact requiring your manufacturer to use parts from a source you provide instead of their usual source can be detrimental to you in terms of delays, overall product quality, and price. When dealing with a board games manufacturer, you want to let them use their sources and preferred partners to provide you a complete solution. Only search for parts suppliers when they come back to you stating that a part or item is not readily available with their current network of partners, or that they cannot offer a competitive price on that item. Companies such as "Lorenz GMBH & co KG" in Geretsried, Germany specialize in the processing of bulk wood to produce board game parts that are treated, shaped, painted and varnished. Don't go bothering them for a bag of 50 wooden cubes, this is an industrial supplier that provides truckloads of parts to manufacturers such as Ludofact. There are several such suppliers in Germany, Poland, and of course the Baltic countries, which have lots of forests and a long tradition of wood craftsmanship. Asia has lots of wooden parts producers as well. I have never worked directly with a wooden parts suppliers as the board game manufacturers I have worked with have always been able to source the parts I requested, and I am careful about using 'standard' parts whenever possible to keep production costs within control. I have not studied the whole process from cutting the tree to the finished wooden cube, so I can only assume some of the steps here. Your manufacturer can pass on specific requests to their suppliers, such as using only wood from forests with a PEFC or similar label, and of course the use of non-toxic and toy safety regulations compliant paints and varnishes. When dealing with Asian manufacturers for wooden parts, you will need to be very careful about the quality of the parts. Wood is a living material, sensible to humidity, sunlight, and can vary considerably in density and hardness according to the source and essences used. Using cheap wood is always a bad idea and will end up costing you a lot more than what you saved in the first place. Moving wood components from country to country and/or from continent to continent may subject you to a host of customs and sanitary regulations. Make sure with your supplier that their parts can safely be imported to where you will be selling the games, and that they comply with toy safety regulations. There are many 'standard' wooden pieces that are used for boardgames. Wooden cubes, meeples, discs, cylinders, ... If you see a part in many game boxes, it usually means it's a 'standard' part. There is a huge advantage in using mostly or only standard parts: these parts are produced by the truckload by the wood factories, so they are cheap, come in many colours (usually 10 or 12), are readily available and can quickly be priced so you get your quotes faster. Sometimes you really need a specific part: a custom-shaped meeple (car, animal, vegetable, you name it), or parts that can be assembled together. For such custom parts you will need to include a detailed description of the part in your quote request along with technical drawings of the part seen from front, top and side (to scale, of course), and all relevant informations (colours, sizes, etc.) Your manufacturer will then consult with his suppliers and tell you whether the part is feasible, and at what cost. If you understand how wood is processed into board game parts, you will be able to assess the cost impact of different shapes. The two most basic woodworking processes are cutting and lathing. Cutting is quite simple and easy: a saw cuts the wood in a straight line. Lathing is used to make cylinders and cylindrical shapes. Any shape more complex than a basic convex geometrical shape with straight sides (triangle, cube, etc.) will require a multi-step process. Shapes like a meeple or house are shaped in three steps. First a rectangular rod is cut. Then the rod is ground against a spinning "shaper" ("spindle moulder" for the U.K. fellows). This is a steel shape on an axle, rotating very fast, that will grind away the shape in the wood rod as it is pressed against it. 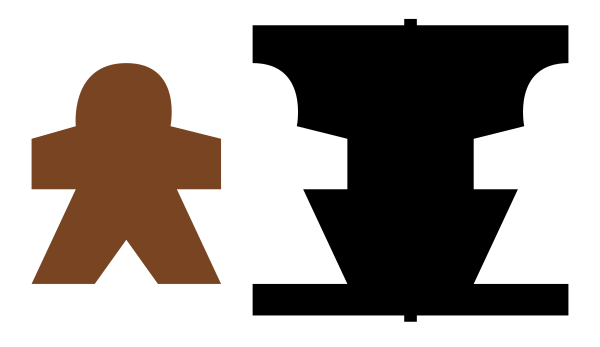 Two such carvers may be required to shape both parts of the part (i.e. symmetrical parts are cheaper to produce). The shaped rod is then eventually sliced into individual pieces. This is the most common and cheapest shaping process. If you need more complex shapes, more steps will be required, and possibly more manual labour. For instance if you want to make cylindrical parts shaped like a face with eyes and a mouth carved from the cylinder, each piece has to be carved individually. Wooden beads with a hole need to be lathed and then drilled individually. Modern factories have robots to process this, but each new shape requires a specific programming, or possibly new tools. Your manufacturer will be able to help you designing sensibly-shaped wooden parts, as they have experience in this. Always listen to your manufacturer's advice on such questions, and ask feedback on your designs. I have found a website from a German wooden parts manufacturer, WeissNaturIdee, where they have several great videos showing the processing of different kind of wood items. They use a lot of CNC machines and robots, but keep in mind in some regions much more of this work would be manual! Here is one of their videos that follows the whole process, from raw trees straight from the forest to bunny meeples, beads, cubes and other parts.